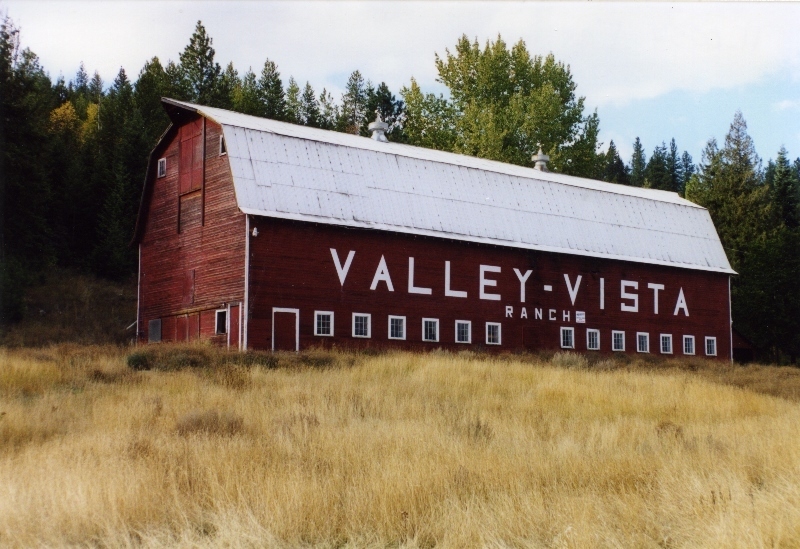 On the side of the hill along US95 at Cocolalla Flats sits the iconic Valley Vista Ranch's big red barn. This barn has watched over the valley since 1949. Nestled on a slope between the hillside and the Burlington Northern Santa Fe Railroad tracks at Cocolalla Flats is the large Valley Vista Ranch barn. This 65-year-old barn has been a local landmark since its construction. Charles and Marian Mase relocated from Montana to the Cocolalla area in the early 1900’s. Mase was an engineer by trade and quickly found work running the trains at the ice house on Cocolalla Lake. In 1909 he filed for a homestead on some property near Cocolalla. The ice harvesting business ended in the late 1920’s with the invention of the refrigerator. Mase resorted to farming and in 1929 purchased the property where the barn now sits. Charles and his two sons, William and Frank, became accomplished barn builders for the area. However, the Valley Vista Ranch barn was not erected until ten years after the death of Charles in 1939. After the death of their father, William, his wife and his brother, Frank, continued to live on the land in Cocolalla Valley as dairy farmers. Early 1949 in between farm duties they cut trees from the property and hauled the logs to a field near the railroad tracks. A man that operated a portable sawmill was hired to cut 78,000 board feet of lumber from those trees. The boards were stacked to dry and a neighbor hauled the lumber to Coeur d’Alene for planing. The Mase brothers started construction in the spring of 1949 and the barn was completed by late summer. The 32 x 120 foot barn is long and narrow with a gambrel roof and flaring eaves. The loft is large enough to store 250 tons of loose hay. Though the ranch was sold in the 1980’s, the new property owners have kept the the barn in it’s original style. In March 2010 the Federal Highway Administration and Idaho Transportation Department planned upgrades on US 95 through the corridor from Chilco to Sagle. There was a possibility that the Valley Vista Ranch would be affected. An Environmental Impact Statement was completed and on June 30, 2010 the decision was made to use a route that will avoid the Valley Vista barn, Cocolalla school and Bond farm that are all considered part of our history. Today the large red with white trim barn sits proudly on the hill overlooking Cocolalla Flats and the valley beyond. The Valley Vista Ranch Barn in 2014 ~ Creator: The Valley Vista Ranch Barn 2014. The barn built in the 1920’s has retained the traditional colors of barns being a red barn with white trim. This barn sits on a slight incline between the mountain and the Burlington Northern Santa Fe railroad tracks. Courtesy of the Bonner County Historical Museum. Boundary County, Idaho barn of 1939.: The normal barn for farms was built in a similar design to the Valley Vista Barn. The loft area was enlarged by the rounded roof to allow for optimum hay storage. The widows peak above the loft door housed hooks and pulleys that were used to help lift the hay into the loft. Courtesy of the Library of Congress. Thomas Feely moving his barn in 1918.: Barns were an important structure on the farm. They were used for storage of hay and equipment, shelter for livestock and at times a community gathering place. 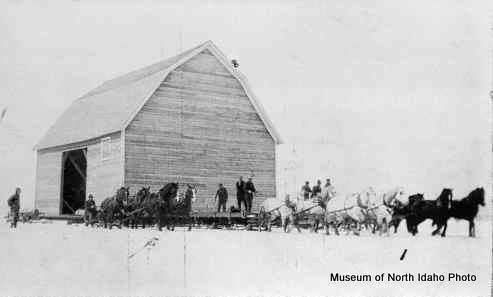 Thomas Feely moved his barn a short distance down the road by teams of horses and a bobsled in February 1918. Courtesy of the Museum of North Idaho. How to hay in the 1940s. : Usually haying in the fields involves a tractor or team of horses pulling a trailer or wagon that can be filled with either loose hay or bails of hay and taken to the barn. However, this family in the 1940s decided to use their trucks to haul the loose hay. Courtesy of John Howard. 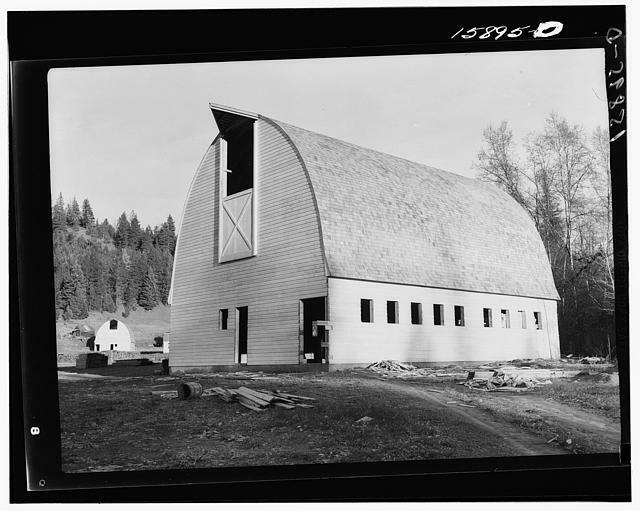 Mary Garrison, “The Valley Vista Barn,” Spokane Historical, accessed April 20, 2019, https://spokanehistorical.org/items/show/579. Renk, Nancy F., Patrick F. McManus, and Idaho County. "Valley Vista Barn." In Driving Past: Tours of Historical Sites in Bonner County, Idaho, 177. Sandpoint, Idaho: Bonner County Historical Society, 2014. "Valley Vista Barn." Final Environmental Impact Statement: Chapter 10 Final Section 4(f) Evaluations. March 12, 2010. Accessed May 10, 2015.